30 years after the creation Neue Slowenische Kunst, join us for an evening exploring the aesthetic universe and the state created by these challenging Slovene artists. 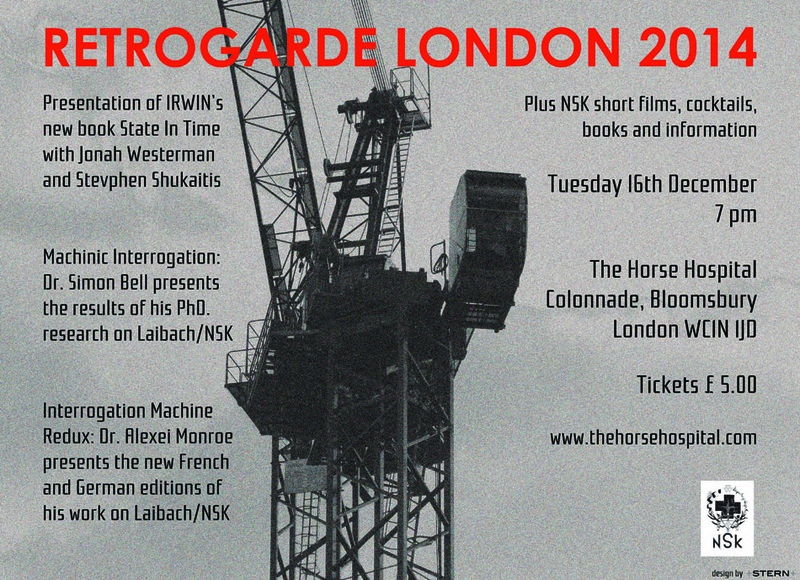 This special evening will take place in London’s historic Horse Hospital, site of the first NSK Rendez-Vous London and the London launch of the NSK Congress book State of Emergence. IRWIN recently published the book State in Time in cooperation with Minor Compositions and the book will be formally presented this evening by publisher/contributor Stevphen Shukaitis and contributor Jonah Westerman. This year Dr. Simon Bell received his PhD. for his research on Laibach/NSK. Tonight he will present the results of his research and be questioned on it by experts. 2014 also saw the publication of updated German and French editions of Dr. Alexei Monroe’s Interrogation Machine. 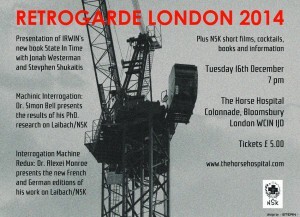 Tonight he will focus on the problematic reception of Laibach/NSK in France, joined in conversation by NSK State Diplomat and Congress delegate Bertrand Thibert, organiser of the first NSK Rendez-Vous. Plus NSK short films, books and information, cocktails. Tickets £5.00 – all door money goes to the campaign to save The Horse Hospital.